Remarkably, all four Main Street buildings visible in this picture from around the turn of the 20th Century are still standing today, though one of them has moved a mile away. 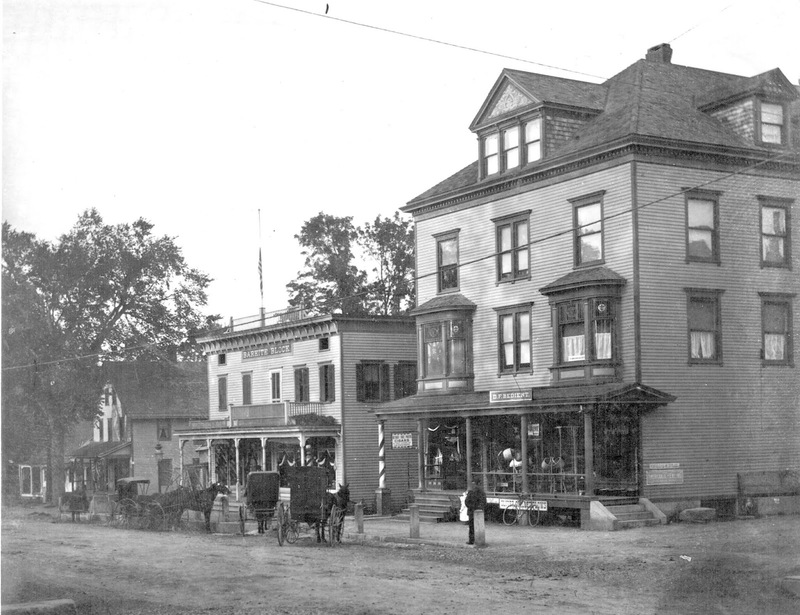 Dominating the photograph at the corner of Main Street and Bailey Avenue is the Bedient building and its D.F. Bedient general store (and funeral parlor) on the ground floor (now Books on the Common). Barely visible on the store’s porch are a variety of wares including a rake, a hoe, sundry baskets, an American flag, and pails or cast-iron pots. A sign on the porch, partially obscured by a bicycle leaning against it, advertises “Oliver Chilled Plows.” Oliver plows were made in Indiana with a “chilling” technique invented by James Oliver that made the iron more durable and its surface stayed smooth despite rough use. They were very popular with farmers in the late 19th and early 20th Century. On the side of the building, a sign advertises American Fencing. Not Gilbert and Bennett Fencing from Georgetown, alas. A rather enigmatic sign is mounted on a pillar holding up the porch at the left (next to a barber pole). The only words visible are “Detroit Free Press CIGARS.” The Detroit Free Press was — and is — a newspaper. What it had to do with cigars is unknown and why a Michigan newspaper would be advertised on a sign in little Ridgefield, Connecticut, is equally mysterious. Perhaps it has something to do with the barber shop that’s not visible down the alley — smoke a cigar and learn the Detroit news while getting a haircut and a shave? The Barhite Block, the next building to the left, was owned by William C. Barhite, who had his dry goods, grocery and feed store there. From 1901 until 1922, the building also housed the main Ridgefield Post Office. Barhite’s building later belonged to Samuel S. Denton, who replaced that prominent “Barhite Block” sign at the top of the facade with one that said “Denton Block.” Today the spot where those signs were advertises not the building’s owner, but a second floor occupant, Robert J. Creamer, attorney at law. There seems to be a gap between the Barhite building and the next one to the left. However, there is actually another building in that space, but it’s set farther back from the road and is just barely visible here. Just beyond that, at the left edge of the picture, there’s the front porch and roof of a building that looks like a small house — and it was, in fact, the small home of the Lannon family. In 1947 this house was moved a mile south to the west side of Main Street where it was named Tuppence and today is the home of Mr. and Mrs. Gary Singer. Where the Lannon house stood in this picture is now 440 Main Street, mostly occupied by the Ridgefield Conservatory of Dance, but once home of The Gap and, earlier, Allan’s Men’s Store.